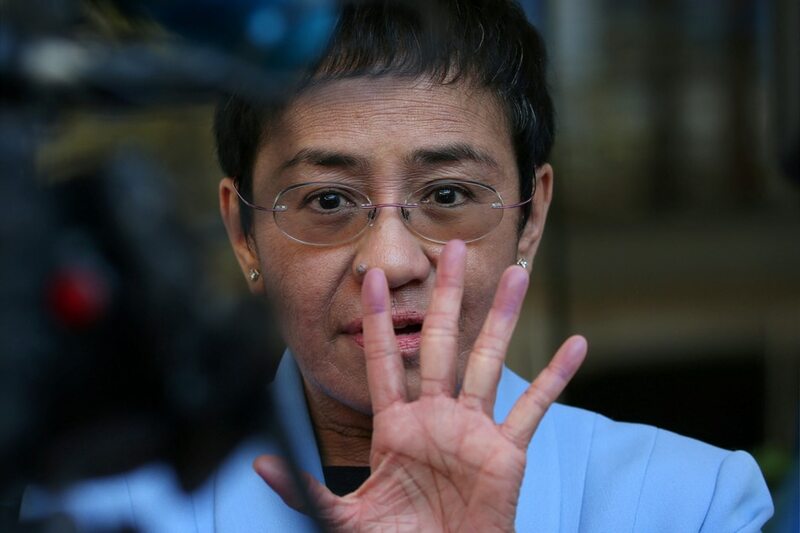 MANILA (6th UPDATE)- Rappler chief Maria Ressa was arrested on Wednesday over a cyber libel case. Ressa was at her office in Pasig City when the National Bureau of Investigation (NBI) agents served the arrest warrant. NBI agents, however, did not handcuff her. Her arrest was streamed on social media by Rappler. The Department of Justice (DOJ) had indicted Ressa and Rappler for cyber libel over a 2012 published article which, it argued, was "clearly defamatory." The Manila Regional Trial Court Branch 46 issued the arrest warrant against Ressa on Tuesday, Feb. 12 according to Rappler. "I will do the right thing. I will keep going," Ressa told reporters following her arrest. Rappler investigative desk editor Chay Hofileña said Ressa's arrest caught them by surprise. "This is something that is both expected and unexpected. We just didn’t expect it today. And we were all caught by surprise. We, of course, were upset by this arrest because we’ve long held that this case really has no basis," she told ANC. "We continue reporting on major events. Of course, we know these cases are intended to intimidate us precisely because we know that’s the intent. We’re not buckling down. We continue with operations," she added. The news website will look for a night court and available judge to post bail for Ressa, Hofileña said. Ressa arrived at the NBI headquarters in Manila at around 7:50 p.m.
"If I spend the night in jail, okay, fine. I think that people should know the line is crossed. But we’re journalists, we do our jobs so we keep going," she told reporters upon arrival at the NBI. "There are a lot of roadblocks, first the timing. You know, coming after the courts are closed, the only court that’s open is asking for documents that weren’t given. The fact that I haven’t even been given my own charge, the DOJ charge, and the fact that the case itself was thrown out by the NBI last year," she added. In tweets, Rappler said "an officer [who was] part of the serving party" also prohibited "Rappler employees from taking photos and videos inside the office." Sought for comment, Justice Secretary Menardo Guevarra said Ressa can post bail for the case. "At any rate, the simple solution is to post bail, whichever case it may be against Ms. Ressa," Guevarra told ABS-CBN News. Guevarra added that Ressa could have posted bail "even before the warrant is served." Rappler, which has published stories critical of the Duterte administration, has scored cases and acts against it as an attack on press freedom. The complaint against Ressa and Rappler was filed by businessman Wilfredo Keng, over an article published by Rappler titled “CJ using SUVs of controversial businessman” during the impeachment trial of the late former Chief Justice Renato Corona. Keng had said he did not lend any vehicle to the late chief magistrate, who had to step down in 2012 over undeclared wealth after he was found guilty by the Senate sitting as an impeachment court. In a resolution dated Feb. 4, Senior Assistant State Prosecutor Edwin Dayog said Rappler, Ressa and reporter Reynaldo Santos Jr. committed libel under the Cybercrime Prevention Act of 2012. “The publication complained of imputes to complainant Keng the commission of crimes. It is clearly defamatory," the resolution read. Aside from cyber libel, Rappler and Ressa are facing tax evasion charges. A year ago, the Securities and Exchange Commission (SEC) revoked Rappler's incorporation papers, citing its alleged violation of the constitutional restriction on foreign ownership of mass media. In a statement, Rappler maintained that Ken's complaint was "preposterous and baseless" as the NBI initially found no basis for the complaint in February 2018 but later on transmitted it to the DOJ. "This is a dangerous precedent that puts anyone – not just the media – who publishes anything online perennially in danger of being charged with libel. It can be an effective tool of harassment and intimidation to silence critical reporting on the part of the media. No one is safe," it said. Rappler added that it will not be intimidated and will "continue to tell the truth." "If this is another of several attempts to intimidate us, it will not succeed, as past attempts have shown. Maria Ressa and Rappler will continue to do our jobs as journalists," it said. "We will continue to tell the truth and report what we see and hear. We are first and foremost journalists, we are truthtellers."